One of the worst feelings ever for an employer is when an employee is hurt on the job. More often than not, employee injuries are due to carelessness on someone’s part. With a proper safety plan in place, these careless mistakes, which often lead to injury, can be prevented. A safety plan is more than a written statement from the owner. It speaks to the values of the company and its owner. You understand as the owner that in order for your organization to be successful, you must protect your employees. They are one of the most important assets that make your car wash the great place it is. In return, your employees understand that they too have an important role in maintaining that balance and protecting that identity. Companies that have found this balance can experience continued success. Safety becomes second nature to them. So what are we saying here? Well, first and foremost, you as the owner have to buy into and believe in the program. If your employees see that you do not take safety seriously, they will not either. Make the effort to tell everyone who works for you that you care about his or her safety and you need their help to create a plan for your company. Here are a few ideas to help you create, or fine-tune, your existing safety plan. Empower and involve your employees. Your best resources for suggestions are the employees that are doing the work. Employees want to be heard. They want to be involved and they want to learn. Employees want to make a difference. Hold a brainstorming session and write down all of the ideas. Make a point to identify hazards and assess different risks. Once you have all of the ideas written down, start organizing them into different categories. Taking the process step by step and not thinking too much about the final result helps the process go a little easier. Here are a few ideas that came out of the brain storming session I had with my employees. Due to constraints on the length of this article, and the average attention span of my fellowoperators, I will only list a few items. • MSDS Sheets for all chemicals in one notebook. Make it easily identifiable for first responders. • Have a protective work-gear station. • Have an emergency eye-wash station. • Create instructions for the proper handling of chemicals. • What type of kit is needed? • Where to locate the kit? • Proper signage identifying the kit. • What type of extinguisher is needed? • Where to locate the extinguisher(s)? • Proper signage identifying the extinguisher(s). • Always be aware of where customers are on the lot. • Don’t take your eye off of a moving vehicle if it is near you. • Drink plenty of water before getting thirsty. • Take frequent short breaks in cool shade. • Cover up. Wear tightly woven clothing you can’t see through. • Use sunscreen. A sun protector factor (SPF) of at least 15 blocks 93 percent of UV rays. • Wear a hat. A wide brim hat, not a baseball cap, works best because it protects the neck, ears, eyes, forehead, nose, and scalp. • Wear UV-absorbent sunglasses. They don’t have to be expensive, but they should be able to block 99 percent to 100 percent of UVA and UVB radiation. According to the Occupational Safety and Health Administration (OSHA), cold stress occurs by driving down the skin temperature and eventually, the internal body temperature. As the body is unable to warm itself, serious illness and injuries, or in extreme cases even death, could result. Types of cold stress can lead to hypothermia. • Wetness/dampness, improper dress, and exhaustion. The reason I include the section on cold stress in my safety plan is due to the wet conditions we work in. Many new employees are not aware of the seriousness of this situation. By educating new employees on this topic during their training process, many problems can be avoided in the future. Tie compliance with the safety plan to individual performance evaluations. If it involves getting paid more, you can bet they will adapt to the program. Create a bonus structure, which involves all employees. Complete surprise inspections and reward accordingly. Budget for safety supplies and employee training. These are additional checks and balances you as an owner have at your fingertips. 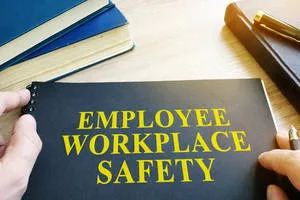 Not only do you see that your employees are purchasing safety equipment, it is a fresh reminder for youeach time you review your budget that you have a safety plan in place. Evaluate your safety plan each year. Determine the strengths and weaknesses within your safety processes. Look for ways to improve them and ultimately reduce accidents and injuries. Implement new and modify existing processes as needed. The main purpose of a safety plan is to prevent workplace injuries, illnesses, and death. It is also to protect from the suffering and financial hardship these events can cause for workers, their families, and you as the owner. The recommended practices use a proactive approach to managing the safety and health of your employees. Traditional approaches are often reactive. They only deal with problems after a worker is injured or becomes sick, or an outside inspection finds a problem that must be fixed. These recommended practices recognize that finding and fixing hazards before they cause injury or illness is a far more effective approach. The idea is to begin with a basic program with simple goals and grow from there. If you focus on achieving goals, monitoring performance, and evaluating outcomes, your safety plan can progress along the path to higher levels of safety and overall health for your employees. Do not let a workplace tragedy alter the future of your car wash or your employees’ futures. Work on and implement a safety plan for your company. Stick to it. Live by it. Make it become a part of your company culture. You will sleep better at night knowing you are keeping your crew safe. Bobby Willis has been in the car wash business for over 20 years. He owns and operates Cool Wave Car Washes in Virginia. He can be reached at bwillis@coolwavecarwash.com.